One of the great pleasures of Paris is wandering through the street markets. And the capital is full of them, selling everything you could imagine (and a few things that will startle you). If you're planning a picnic, or just a snack sitting by the Seine, stock up at the stalls with their irresistible breads, cheeses, charcuteries and fruit. If you're after a gift, either for yourself or for a friend, make your way to one of the flea markets (marchés aux puces) that fill the streets on a weekend. Part and parcel of the street scene of Paris, flea markets date from the 18th century when rag-and-bone men (chiffoniers) rifled through the rubbish bins of the Parisian aristocrats then sold what they found outside the gates of Paris to avoid prosecution, fees and taxes levied by the city authorities within their jurisdiction. 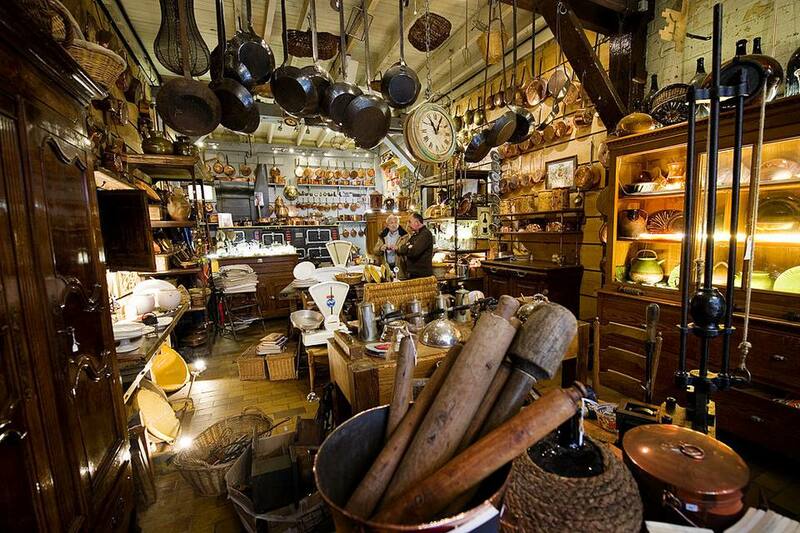 Today you'll find the biggest flea markets close to the Boulevard Péripherique. You'll also find small markets in the heart of Paris that either specialise in brocante and antiques or are part of a bigger, general street market. This delightful market, used mainly by discerning locals, champions seasonal fruit and vegetables and flowers. But it’s also the place for olive oil and its related products like soaps, as well as organic food from Sardinia and other places that come straight from the producers who will happily discuss what they are selling with you. Address: 34, Bd des Batignolles, 8th arrondissement. This is another excellent farmers market where you’ll find wonderful vegetables like heirloom tomatoes bursting with flavour plus high-quality fish and dairy products as well as poultry and flowers. Centrally placed near near Hôtel de Ville and on the edge of the fashionable Marais, this was the first market to stay open after the usual lunchtime or early afternoon closures. Its evening hours brings all the locals and you will also find it included in food tours offered in Paris like the cooking tour from la cuisine Paris. Address: Place Baudoyer, 4th arr. Founded in 1987 in a former horse market, around 100 antiquarian and old book specialists sell a variety of titles under the awnings along Georges Brassens park near the Porte de Vanves. Pick up fashion books from the 19th century, comic books, books of maps (very expensive) and some wonderful leather-bound tomes. Most of the books are in French but you will find some English books as well. 104, rue Brancion, Parc Georges Brassens (under the pavilion Baltard), 15th arr. This is a must for contemporary art lovers who flock to the largest weekly art market in Paris. Around 200 artists, from ceramists to jewellery designers, from engravers and painters to photographers all exhibit here. It runs all the way along the Boulevard Richard Lenoir. Address: Boulevard Richard Lenoir, 11th arr. No list of markets in Paris would be complete without the most famous of all, the flea market outside the centre which sees around 3,000 traders vying to seduce the 180,000 visitors who flock here each weekend. Go with a strategy; it’s vast and labrynthine and is actually a series of little villages, some covered; others on open-air streets with small shops for the more upmarket antique dealers. Address: Avenue de la Porte de Clignancourt, 18th arr. This small and friendly flea market is a very good alternative to the vast Clignancourt/Saint-Ouen market. It’s excellent for small items from the 300 odd traders, from antique jewellery to plates, figurines to vintage clothes. It dates back to the 1920s and is largely a local market. Address: Avenue Georges Lafenestre and Avenue Marc Sangnier, 14th arr. This delightful, colourful flower market started in 1830 and has been going strong ever since. Buildings from the 1900 provide the covered part; there are also open-air stalls selling every kind of flower you could possibly want. Address: Place Louis Lépine/Quai de la Corse, 4th arr. If you’re a stamp collector you’ll know this famous open-air market for rare and collective postage stamps. It’s also a good place for postcards of long-forgotten places. You might recognise it if you know the film Charade (1963) when Cary Grant and Audrey Hepburn watch James Coburn. Address: Avenue Marigny, 8th arr. Located at the train station for eastbound trains from Paris, this Christmas Market is the place to pick up specialties from Alsace, saving you travelling to this eastern part of France. Pick up regional foods like the famous sauerkraut, as well as lots of gingerbread, little Christmas biscuits and traditional decorations.